Aspiration, excitement, relation disappointment, hope, ecstasy - a calendar year witnesses all these emotions at some point or the other. Jamshedpur FC and its loyal supporters went through all of those in 2018 as in its first year of the Indian Super League, the team narrowly missed out on qualifying for the playoffs. Following their already established tradition, the convocation ceremony for the 13th batch of Tata Football Academy (TFA) took place at the Michael John Auditorium at Jamshedpur. 19 cadets from 7 States celebrated their graduation from the academy after a four-year residential training course designed to develop their potential to the fullest. Mr TV Narendran, CEO & MD, Tata Steel graced the occasion as Chief Guest. while Professor Nazm Ansari, President, Jharkhand Football Association participated as Guest of Honour. 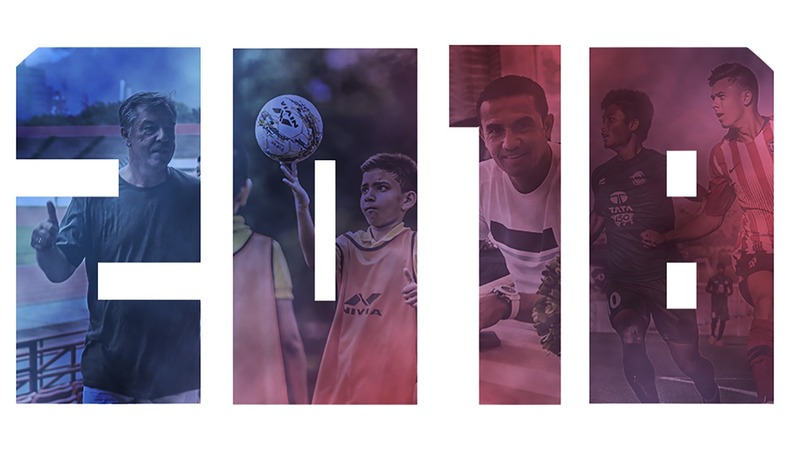 2 With the long-term vision of making the city of Jamshedpur and the Jharkhand region a hotbed for football, Jamshedpur FC launched the grassroots programme for the first time in Jamshedpur. The grassroots programme would be helmed by Mr. Kundan Chandra. Kundan, had served in the Indian Navy officer with the background of aeronautical engineering and had a rich pedigree of coaching background. He is an AFC A Licensed Coach, FIFA Grassroot Instructor, AFC C License Instructor and an AIFF D License Instructor. On his arrival Kundan said,“I would like to thank the club management of Jamshedpur FC for giving me an opportunity to be a part of this family”. 3 Jamshedpur FC kick-started their Grassroots Initiative with a Workshop for coaches present in the city of Jamshedpur. The workshop was held at Tata Football Academy from 16-18 July with Head of Youth Development Mr. Kundan Chandra in-charge. The workshop also integrated with a Grassroots festival saw over 120+ kids participate from various schools across the city. The participants who successfully made their journey over the three days thoroughly enjoyed working and learning as coaches. 4 With hopes of a successful league campaign the second time round, Jamshedpur Football Club appointed César Ferrando as the new Head Coach. The experienced Cesar had a decorated career as a player and as a coach having managed teams such as Atlético Madrid, Valencia B, Elche, Albacete (La Liga & Segunda Division Clubs). In his last assignment with the Spanish Club, La Nucia, he had an extremely successful stint. He had also previously coached in Asia where he managed Malaysian outfit Johur Darul Takzim FC in 2013-14. César also laid down his thought as he was showed around the city as he said, “Our main objective will be giving our best every day at every training session and make the team compete at the highest level every game we play”. 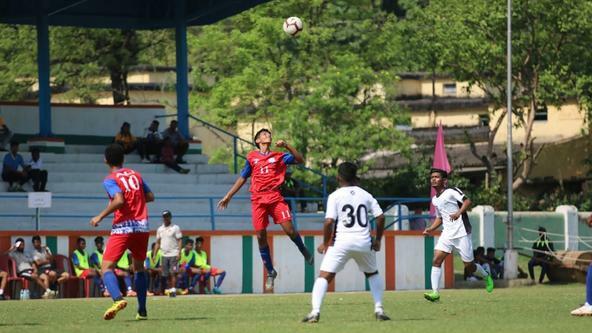 5 As the month of July drew to a close, Jamshedpur FC sent their Reserves team to participate in the LG Independence Cup organized by the Mizoram Football Association (MFA) in Aizawl. The tournament would see ten teams participating, where the Jamshedpur FC would be the only team outside the state of Mizoram. The teams had been placed into two groups and Jamshedpur FC would be part of Group B along with Mizoram Premier League champions Chhinga Veng FC, Mizoram Police, Kanan FC and Chawnpui FC. The Jamshedpur FC Reserves would leave for the tournament on 27th July. For their inaugural LG Independence Cup match the Jamshedpur FC Reserves suffered a 2-1 defeat at the hands of Chawnpui FC. For Jamshedpur, Billu Teli got on the scoresheet in the 16th minute as he calmly slotted home a penalty. But it was not enough to secure a win over the Mizoram side as the Jamshedpur reserves began their Group B expedition with a disappointing start. Jerry Mawia, Jamshedpur FC's star winger, was in attendance for the game with his family to cheer on the youngsters. After falling to a narrow defeat in their first match, Jamshedpur FC Reserves salvaged a draw vs Kanan FC in the Independence Cup. The Reserves side would next play on August 6 against Chhinga Veng FC which had become a must win game for them. With the grassroots programme already launched, Jamshedpur Football Club held its first Grassroots Football festival at the Sumant Moolgaokar Stadium collaborating with Hill Top School, Jamshedpur under aegis of Mr. Kundan Chandra, Head of Youth Development and Grassroots Jamshedpur FC. The festival saw a stupendous response as over 670 children registered and participated between the age group of 3-12 years from the Hill Top School. 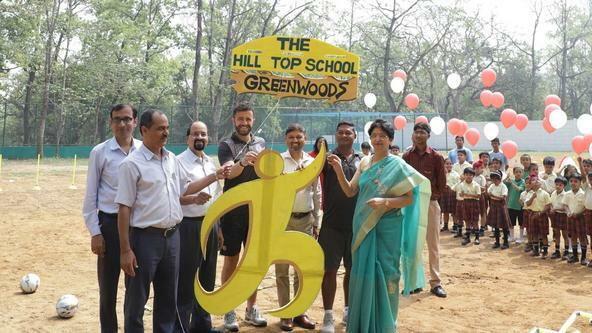 The students of the Hill Top School volunteered and compered for the entire festival along with 35 Red Miners members who helped in the overall operations. The children were mentored by 20 Grassroots leaders from the course held last month and more than 10 parents volunteered in organizing the festival. Moving on to the Jamshedpur FC Reserves, they managed a 1-1 draw against Mizoram Police in their final group game of the LG Independence Cup. After suffering a defeat in their last match against Chhinga Veng FC, the Reserves fought hard to win a point against their opponents. To sum their tournament up, the youth side managed two draws and were handed two defeats in the LG Independence Cup. Captain Billu Teli was the highest scorer of the side with two goals. With Cesar Ferrando at the helm, Jamshedpur FC added some Spanish creativity to the squad by signing the Spanish trio of Carlos Calvo, Pablo Morgado and Sergio Cidoncha. Carlos came with La Liga experience from his stint at Granada and had also been part of Serie A club Udinese. The 32-year-old is primarily an Attacking Midfielder who can also play as a Winger. 28-year-old Sergio Cidoncha is a midfielder who started his career in Atlético Madrid's youth setup. He gradually stepped up the ladder to play for Atlético Madrid's B team and later with teams like Real Zaragoza and Albacete, who play in La Liga 2 (Segunda Division). The third addition, Pablo Morgado, primarily would play as a Right Winger and previously plied his trade at CF La Nucía under Jamshedpur FC’s newly appointed Head Coach César Ferrando. Jamshedpur FC would depart for Madrid, Spain on the 14th August 2018 to take part in the pre-season camp. The team would be playing five practice matches in the duration of a month-long tour. The team would be training at the Los Ángeles de San Rafael facility in Spain. This training facility was famous for hosting the preseason for La Liga giants Atletico de Madrid. Cesar Ferrando along with his backroom staff would join the Indian squad and the foreigners signed for the first time in Madrid. With the grassroot programme launched and the concept of grassroots football properly introduced to the city by conducting grassroot festivals, Jamshedpur Football Club, in collaboration with Mt. Litera Zee School, Jamshedpur (MLZS), launched its first football school keeping in line with the vision of the club’s Grassroots Programme. The training center would cater to kids of the age groups U5, U8 and U11. In a landmark moment for the club, the club’s Head of Grassroots and Youth Development Mr. Kundan Chandra commented, “Keeping in the lines of the vision of grassroots football we set for the club just a few weeks ago, this was a swift move for the us thanks to the co-operation and enthusiasm showed by MLZS, Jamshedpur. When we shift our focus back to Spain where Jamshedpur FC scripted their first win of the pre-season with a 1-0 victory over Spanish outfit, Torrelodones C.F. Memo Moura scored the solitary goal of the match for Jamshedpur as he netted in the 47th minute. New signing, Carlos Calvo delivered the assist for the winning goal. Back in India, Tata Steel in Sukinda, Odisha organized an Inter Feeder Centre Football Tournament 2018. The venue for the tournament was Katey Purty Stadium, Sukinda Chromite Mines, Odisha. Six teams participated in the competition and the event was graced by the presence of Jamshedpur Football Club Head of Grassroots and Youth Development, Mr. Kundan Chandra. The Tata Football Academy Feeder Centre (U-15) who had participated in this event emerged as the runners-up to Chrome Valley FC. The final turned out to be a close encounter where the young colts from TFA emerged as the second-best team. Having won their first match in pre-season, Jamshedpur FC lost 3-0 against UD San Sebastián de Los Reyes in their second pre-season match. Jamshedpur FC could not build on their positive start. It was UD San Sebastián de Los Reyes that broke the deadlock as Sergio Castel scored from a direct free-kick. Jamshedpur FC made wholesome changes at the break with six new outfield players entering the field in the second half. Searching for an equalizer, Jamshedpur FC tried their best to level the proceedings but conceded two more in the final 20 minutes of the game. Andy Escudero and Giovanni Navarro got on the scoresheet for the Spanish third division side. On the 31st of August Jamshedpur Football Club and Wellington Priori mutually agreed to part ways for the 2018/19 Indian Super League season. The club thanked him for his contribution and wished Wellington all the best for his future endeavors. Jamshedpur FC bolstered their squad with young recruits Aniket Jadhav and Amarjit Singh as the duo signed till the year 2021. Both players were part of Indian National Football Team’s FIFA U17 World Cup squad and had plied their trade for Indian Arrows in the I-League. At 17 years of age, Amarjit, who was born in Manipur, played as a center midfielder and was the captain of the Indian team in the FIFA U17 World Cup squad. Along with him, 18-year-old Kolhapur boy, Aniket Jadhav, showed promise as a forward as they shared a camaraderie together. The youngsters would be loaned back to Indian Arrows for one more season for them to gain more playing time in the I-League. Jamshedpur FC at the start of the month, make a big statement in the league by signing the likes of Aussie legend Tim Cahill. His signing was regarded as the biggest coup of the Hero Indian Super League (ISL) 2018/19 season. The 38-year-old played as an attacking midfielder but, had also played as a forward on several occasions. A box-to-box midfielder, Cahill has become recognized for his aggressive and powerful approach and his ability to head the ball in the penalty area. Cahill brought a lot of rich footballing experience to the club having scored 168 goals in 694 club appearances in his illustrious career. The Aussie played long spells for Premier League heavyweights Everton and Championship club Millwall. With Jamshedpur FC’s Grassroots Programme up and running, the club successfully hosted a Grassroots Football Festival at DBMS High School in Kadma. The JFC-DBMS Football Festival saw over 500 kids from the age groups of 3-years to 12-years-old of the school participate and enjoy thoroughly early morning on a Saturday. Along with the coaches deployed, the festival also saw JFC’s Reserve team players take part in it as they guided the kids with small-sided games across the ground. On the 3rd of September Jamshedpur Football Club completed their quota of foreigners with the signing of Mario Arques Blasco. The Spanish midfielder was a Villareal CF academy product with over 7-years of experience in Spain. The 26-year-old previously played CD Alcoyano and had stints at Valencia and Sporting de Gijon’s B-teams. Mario joined the squad for pre-season training in Madrid as the club continued to prepare for the Hero Indian Super League 2018-19 season. Continuing their pre-season tour in Madrid, Jamshedpur FC faced Gimnástica Segoviana in a match where both teams shared the spoils with the final score being one goal apiece for both the sides. The Indian Super League side went into the break with a goal behind and made as many as seven changes at half-time. Most notable of those changes was Mario Arques, the Spanish midfielder who made his debut for Jamshedpur FC and had an immediate impact on the game. He controlled the midfield and started creating more chances in the second half. Gourav Mukhi, the youngster who scored the all-important equalizer for the Indian outfit in the 82nd minute courtesy of an excellent 30-yard run going past the goalkeeper. My perception about Indian football is really positive. When you look at some of the international footballers that have been here and graced the football pitches in India, I feel that has made a positive influence because it made the right kind of noises everywhere. Having shared the spoils in their last match against Gimnástica Segoviana, Jamshedpur FC got back to winning ways by defeating Mostoles Balompie. It was an emphatic victory as the side scored three goals and kept a clean sheet. Gourav Mukhi scored two goals in two minutes while Tiri completed the rout with a fine header. A second half blitzkrieg saw Jamshedpur FC score three goals in thirteen minutes! Building on the grassroots initiative, Jamshedpur FC conducted their Grassroots Football Festival at Tinplate Stadium with students of Kerala Samajam Model School (KSMS), Golmuri. The Festival saw over 500 enthusiastic registrations for the event from KSMS with Mr. Kundan Chandra at the helm of all the action. 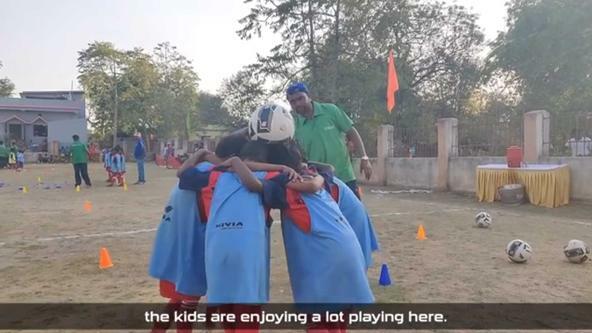 A notable mention must go to the Red Miners, the supporters club of Jamshedpur FC, who actively participated in the festival as volunteers as the kids enjoyed on the field. In their final match of pre-season, Jamshedpur FC registered a brilliant 1 - 0 win over Atletico Madrid B in Madrid, Spain. The Spanish signing Sergio Cidoncha was the architect of this convincing win as he scored the winning goal in the 54th minute. Cesar Ferrando's men dominated possession from the word go and were creating chances one after the other. Cidoncha and Jerry attempted shots on goal in the first half, but their efforts were saved by the Atletico goalkeeper. Atletico Madrid B put the pressure on in the last few stages of the game, but Raju Gaikwad marshalled the defence well and also put in a last-ditch tackle. With this 1 - 0 win against a tough opponent, Jamshedpur FC ended their Spanish expedition on a high note. After participating in the LG Independence Cup last month, Jamshedpur FC Reserves team would then battle it out in the Bodousa Cup 2018. The tournament had been organized by Bodousa FC along with Assam Football Association and would be held at eight different venues across the state of Assam. Teams from all over the took part in the competition along with clubs from neighbouring countries such as Bangladesh (Saif Sporting) and Nepal (Shyachal Youth Club). Jamshedpur FC Reserves would play their first match against the winners between Assam Rifles and the champions of Group A on September 17th. As part of a football development and player exposure initiative, Tata Trusts conducted trials with support from Jamshedpur Football Club (JFC) for young and rising prospects of Jamshedpur and surrounding areas. 100 players from these preliminary trials were selected for the final round. Over 500 players, born in the years of 2004, 2005 and 2006 came down to prove themselves for this unique opportunity. The trials were being conducted with the help of JFC’s Head of Grassroots and Youth Development, Mr. Kundan Chandra. Jamshedpur FC Reserves booked their place in the final four of the tenth edition of Bodousa Cup with a sensational win over Moran Town Club. The score was tied 2 - 2 after the end of regular time and the match had to be settled by a penalty shootout. The Reserves side got the better of their opponents, winning 4 - 3 on penalties. In the semi-finals the Jamshedpur FC Reserves would face Chyasal Youth Club. The JFC Reserves got the better of the side from Nepal with a slender 1 - 0 margin. Prashant Naik emerged as the match winner for the youth side as he netted the winner in the 33rd minute. This win propelled Jamshedpur FC (JFC) Reserves to the final of the prestigious Bodousa Cup 2018 where they would face Saif Sporting from Bangladesh. 12 With the winning momentum behind them, the Jamshedpur FC (JFC) Reserves outfit unfortunately fell at the final hurdle to be the winners of the prestigious Bodousa Cup competition, organized in various places in Assam. JFC Reserves slumped to a 2 - 0 defeat against Saif Sporting, in the grand finale. Despite being on the losing side, Md. Asifullah of JFC Reserves was adjudged as the man of the match. And despite not being able to get their hands on the elusive trophy, the Bodousa Cup 2018 would prove to be a huge learning curve for the JFC Reserves side for years to come. On the national front, Jamshedpur FC player namely; Sumeet Passi, Farukh Choudhary and Bikash Jairu received national team call-ups to face China in a friendly game on October 13. The match against China would be a perfect test for the Indian side ahead of their preparations for the AFC Asian Cup in January. Both these sides had met each other 17 times before with India not being able to get the better of China on even one occasion. This would also be the first time that India would face China on foreign soil. With the beginning of the new season on the horizon and Keeping in mind the demand of the fans and to bring the fans together to watch away matches, Jamshedpur FC (JFC) would organize the JFC Fan Park at Modi Park near JRD Tata Sports Complex. The JFC Fan Park would be free of cost and open to all with one 20ft x 10ft mega Dolby screen for the fans to rejoice JFC playing on away days with Dolby surround sound system all around the park. The fans who would visit the fan park would also get the chance to win some cool JFC merchandise and tickets to home matches via fun contests hosted and conducted by the club. 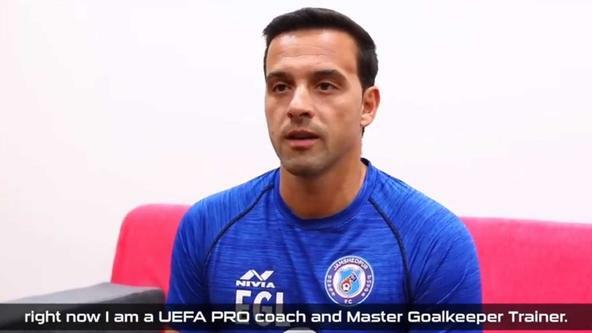 Ahead of making his managerial debut in the Indian Super League against Mumbai City FC, Jamshedpur FC head coach Cesar Ferrando indulged in his first interview as the manager of the club and previewed his first match and Jamshedpur FC’s second expedition in the Indian Super League. The most notable thing to draw from his initial interview was the way he spoke about his footballing philosophy, he mentioned; “My philosophy is to win. I don’t know any coach who doesn’t want to win. You can play long or short, it doesn’t matter. You have to win”.